There are a lot of factors which combine to make a good-sounding loudspeaker, the making of which is still a black art. There are, however, certain fundamentals that we can draw upon to evaluate a loudspeaker's technical design, and thus have an idea of the potential of its sound. No, I'm not saying that a technically well-designed loudspeaker will sound good, simply that it has the potential to sound good. Conversely, a technically ill-designed loudspeaker has similar potential to sound bad! Within the piano-glossed, solid MDF (medium density fibre-board) speaker cabinets, behind the esoteric drivers, lie one of the integral components of loudspeakers - the crossover. Simply put, the crossover accomplishes the task of passing the "correct" frequency range of electrical signals to each driver (I.E., woofer receives bass, tweeter receives treble frequencies). It ensures the synergy of the drivers working as a whole to form a loudspeaker. The illustration above shows a conventional crossover, whose main parts are capacitors, inductors and resistors (Some cross-overs may include tweeter protection circuitry and other frills). These 3 main types of components, when connected in a special way, produces the required crossover. IMHO, this bass inductor plays a major part in the bass-reproducing capabilities of a speaker. 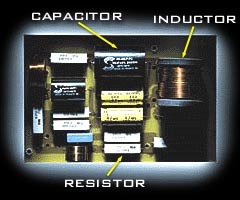 The direct-current resistance (DCR) of this inductor is an important property. For example, if a bass inductor (DCR=2 Ohms) is used in conjunction with a 4 Ohm woofer, roughly 1/3 of the energy will be wasted in heating up inductor. In other words, valuable amplifier watts are wasted. In addition, the amplifier will not be able to use its damping factor on the woofer very well (The lower the DCR of the inductor, the better the amplifier can damp/control the woofer). As a reference, DCR of inductors range from fractions of an Ohm (DCR<<1 Ohm, GOOD!) to several Ohms (BAD!). There are also differences in sonic characteristics of the 2 types of inductors: air-core and ferrite-core. Air-core inductors are simply coils of wires. Ferrite-core inductors have a soft iron core in the centre of the coil of wire. This concentrates the magnetic flux, thus producing higher inductance values for less number of coils. Thus, less wire is needed and the DCR of ferrite-core inductors are usually lower than that of air-core. But wait! Ferrite core inductors have a downside! The introduction of the ferrite core brings in other problems, such as hysterisis losses and flux saturation. In fact, air-core inductors have a tendency to sound BETTER than ferrite-core inductors. In order to lower the DCR of air-core inductors, manufacturers have to increase the gauge of the wires used. This results in air-core inductors being larger and more expensive than ferrite-core inductors having similar values. Thus, we can see that a good inductor has the following properties: (1) Air-core (opinions may vary) (2) Low DCR (2.1) Tightly wound coils (contributes to lower DCR) (2.2) Thick gauge / High quality OFC (oxygen free copper) wire (also contributes to lower DCR). As good inductors are very expensive (as least from the manufacturer's point of view), most speakers (even many "high-end" ones) contain poor inductors. Perhaps, before you decide to plonk down wads of cash for that new speaker cable that will give you "much tighter and defined deep bass", think about that bass inductor that is present inside your speaker first! I always believe that money is best spent on the weakest link in the audio chain.